For four generations, Big Bob Gibson has been cooking up famous mouthwatering slow-cooked meats and nationally award-winning sauces. Deemed by barbecue connoisseurs and readers of the Birmingham News as the "Best Barbecue Restaurant in Alabama," Gibson's offers a championship red sauce, flavorful Alabama Red, Fiery Habanero Red and a tangy original white sauce and others that are guaranteed to tantalize the taste buds. The restaurant has a loyal following that includes housewives, factory workers, truck drivers, doctors, lawyers, teachers and others. The great-grandson-in-law of legendary Alabama pit-master Big Bob Gibson, Decatur’s Chris Lilly has made a name for himself among barbecue's elite. Now the executive chef for Big Bob Gibson Bar-B-Q restaurants and head of the Big Bob Gibson Competition Cooking Team, Lilly is also the corporate spokesperson for Kingsford charcoal and author of Big Bob Gibson’s BBQ Book. Under Lilly's leadership, the competition team has won multiple state championship cook-offs, more than 10 world championships and has taken the Best Sauce title at the American Royal International Barbecue Sauce Contest. In 2011, Lilly's team was crowned World Champion at the annual Memphis in May competition. Open daily, 9:30 a.m.-8:30 p.m. In the 1920s, vinegar-and-mustard-based Carolina-style sauce was the predominant choice of barbecue cooks. Big Bob Gibson didn't think it complemented his chicken very well, so he came up with his own mayonnaise-based condiment, which also contains vinegar, apple juice, horseradish, lemon juice, black pepper and cayenne pepper. 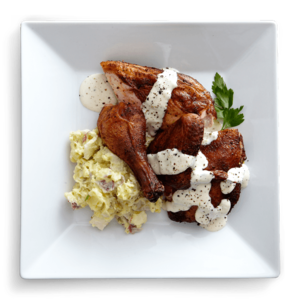 Big Bob Gibson's split, seasoned chickens are laid open on the barbecue pit for several hours and then dipped in white sauce. The unique flavor of the sauce, combined with meat smoked in hickory-fired brick pits, helped the restaurant take off and established white barbecue sauce as a North Alabama regional specialty. Four generations of the Gibson family have continued the restaurant's tasty traditions. The tangy sauce has become so popular that it is now bottled and distributed to more than 2,000 grocery stores in eight states. Locals also use the white sauce as a marinade, basting and table sauce. This dish has helped Big Bob Gibson Bar-B-Q rack up eight state championships and 10 world championship titles, including Grand Champion at the 2000 and 2003 Memphis in May World Championship cook-offs and Grand Champion at the 2004 American Royal Barbecue international contest. 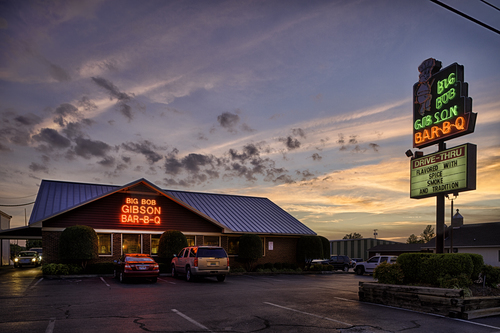 Although most customers at Big Bob Gibson's are stuffed after a plate of smoked barbecue and side dishes, they always seem to find room for a slice of pie at the end of the meal. The chocolate, lemon and coconut cream pies, made fresh every morning, have been on the menu since the 1950s. These cool, creamy pies are piled high with whipped meringue and can be purchased whole or by the slice.